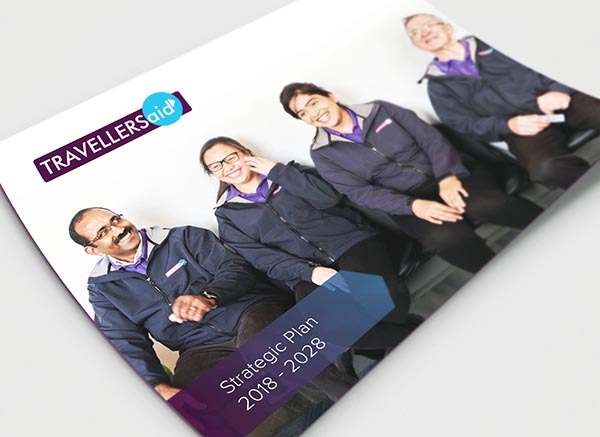 It is with great pleasure that I present to you Travellers Aid Australia’s Strategic Plan 2018 – 2028. A plan that is designed to best support our clients and identify opportunities to grow our services over the next ten years. During 2017/18 Travellers Aid worked closely with the transport sector, not for profit sector and our clients to develop a clear strategic direction to assist with the development of this plan. We would like to thank all our stakeholders, staff, volunteers and government officials who contributed their time and expertise. Everyone’s combined insights and thoughts have helped to make this document a dynamic road map that will be reviewed regularly, so that it remains fit for purpose and best serves our clients. Over the coming ten years Travellers Aid will continue to strive to empower people with travel related challenges to connect, engage and participate within their communities through the use of public transport. Should you wish to join us on this journey and become a part of Travellers Aid via partnership, sponsorship or even volunteering, I invite you to reach out and contact us.